Two models of multiparameter sondes manufactured by Xylem, parent company of Yellow Springs Incorporated (YSI)—EXO1 and EXO2—equipped with EXO conductivity/temperature (C/T), pH, dissolved oxygen (DO), and turbidity sensors, were evaluated by the U.S. Geological Survey (USGS) Hydrologic Instrumentation Facility. The sondes and sensors were evaluated in two phases for compliance with the manufacturer’s specifications and the USGS acceptance criteria for continuous water-quality monitors. Phase one tested the accuracy of the water-quality sondes equipped: (a) with a C/T, pH, DO, and turbidity sensor by comparing the EXO sensors’ measured values to those of an equivalently configured YSI 6920 V2-2 sensor, and (b) with multiple sensors of the same parameter type (such as three pH sensors and a C/T sensor) on a single sonde at room temperature and at an extended temperature range. In addition to accuracy, the communication protocols and the manufacturing specifications for range of detection and operating temperature were also tested during this phase. Phase two evaluated the sondes’ performance in a surface-water environment by deploying an EXO1 and an EXO2 equipped with pH, C/T, DO, and turbidity sensors at USGS site 02492620 located at East Pearl River near Bay Saint Louis, Mississippi. The EXO sondes’ temperature deviations from a certified YSI 4600 digital thermometer were within the ±0.2 degree Celsius (°C) USGS criteria, but were greater than the ±0.01 °C manufacturing specification. The conductivity sensors met the ±3 percent USGS criteria for specific conductance greater than 100 microsiemens per centimeter. The sensors met the more stringent ±0.5 percent manufacturing specification only at room temperature in the 250 microsiemens per centimeter (µS/cm) standard. The manufacturing and USGS criteria (±0.2 pH unit) were met in pH standards 4, 9.2, 10, and 12.45, but were not met in pH 1.68 standard. The DO sensors met both the ±0.3 milligram per liter (mg/L) USGS criteria and the ±1 percent manufacturing specification. The ±5 percent USGS criteria for turbidity in waters not exceeding 2,000 formazin nephelometric units (FNU) were met by the five turbidity sensors tested; however, all five sensors failed to meet these requirements at turbidities exceeding 2,000 FNU. The more stringent ±2 percent manufacturing turbidity specification for water with less than 1,000 FNU was met by only one of the five sensors tested. The results from the field deployment indicated acceptable agreement in temperature, specific conductance, pH, and DO between the EXO sondes, the site sonde, and the reference sonde. The EXO1 and EXO2 turbidity measurements differed from the site sonde by approximately 23 and 25 percent, respectively. 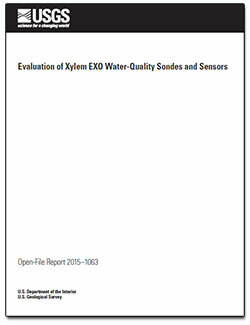 Snazelle, T.T., 2015, Evaluation of Xylem EXO water-quality sondes and sensors: U.S. Geological Survey Open-File Report 2015–1063, 28 p., https://dx.doi.org/10.3133/ofr20151063.